Air plants are slow growing plants, but you can give yours a boost that will assist your air plants in producing pups (babies) and colorful flowers. For more growth and more flower color, as well as overall health, start fertilizing your air plants–with a light hand. 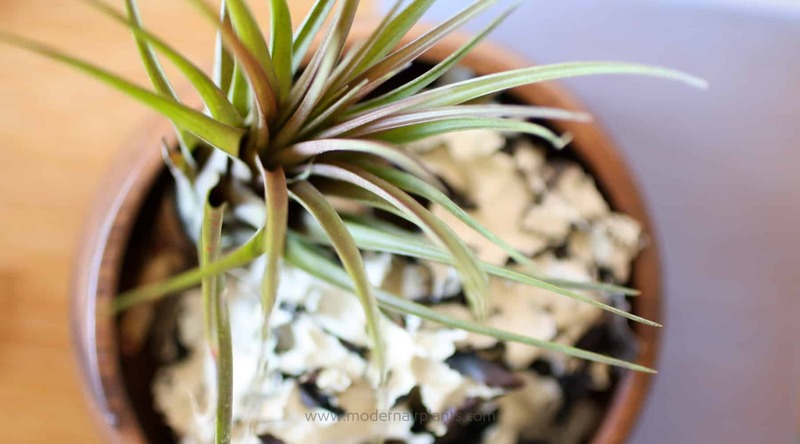 Air plants can be easily burned by too much fertilizer and not all fertilizer will work for air plants. Use a fertilizer made specifically for Tillandsia. Be sure to use a non-urea nitrogen fertilizer as this type of fertilizer depends on bacteria in the soil to break down the nitrogen into a usable form. Since air plants absorb their nutrients directly through trichomes on their leaves this type of fertilizer will harm air plants. 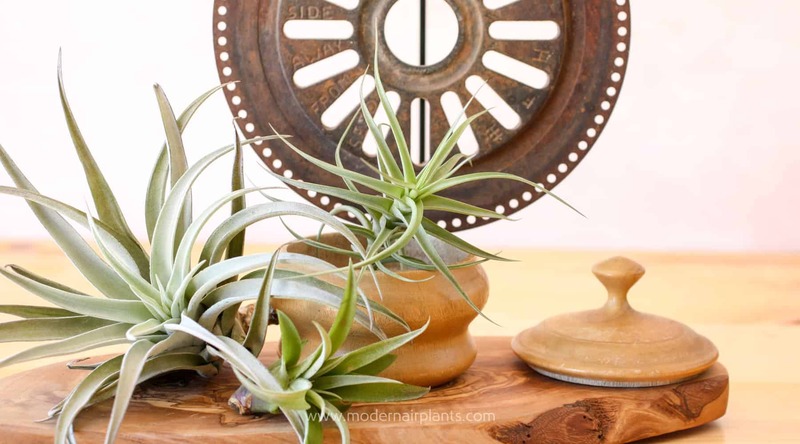 Also avoid fertilizers containing boron, copper or iron, which are toxic to air plants. Fertilizers contain 3 main components: nitrogen (N), phosphorus (P), and potassium (K). Nitrogen promotes healthy leaves, phosphorus encourages flowering and potassium supports overall plant health. These nutrients are represented as an NPK percentage. A label reading 17-8-22 contains 17 percent nitrogen, 8 percent phosphorus, and 22 percent potassium. Recommended strength is to use 1/4 teaspoon or 1/4 strength per gallon of water, whichever is less. 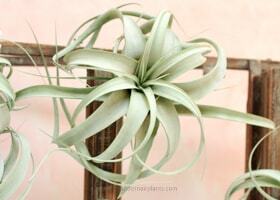 When fertilizing air plants, I suggest using a fertilizer formulated specifically for tillandsias or bromeliads. 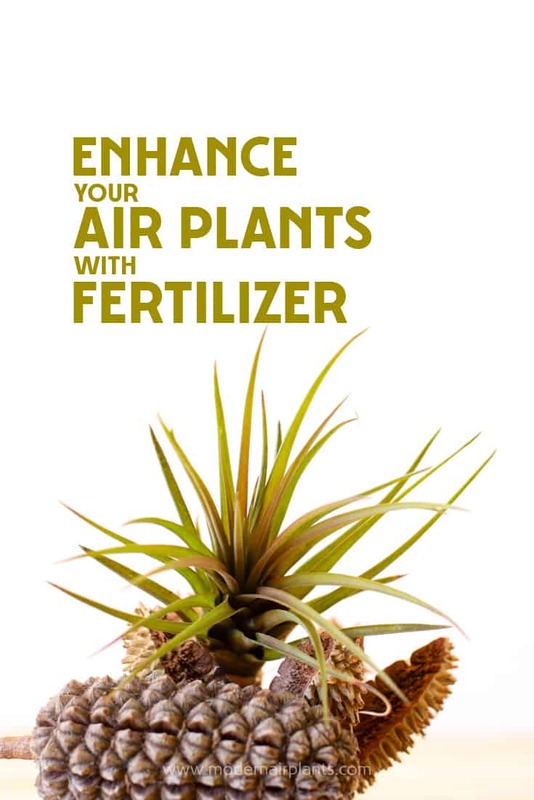 This will help you to avoid elements which are toxic to air plants but commonly added to most fertilizers. Choose between a pre-mixed spray fertilizer or a granular fertilizer. If convenience is your top priority, go with a spray fertilizer. It is the easiest option as the fertilizer is pre-mixed and ready-to-go. Be sure to spray all side of the plant. To get the most fertilizer for your money, go with a granular fertilizer. Add the prescribed ratio of fertilizer to the water. To economize, even more, save and re-use the water containing fertilizer. Label the water as fertilizer water, so it is not confused with other water. Tip: To avoid fertilizer burn, fertilize once a month after watering, then monitor your plants to gauge your plants’ reaction to the fertilizer. If you use a water soluble fertilizer, simply add the fertilizer to the water. Once the fertlizer has dissolved add the air plants. Remember, air plants will live a long time without fertilizing, but too much fertilizer will burn or kill an air plant, judicious fertilizing, no more than once per month, will encourage growth and flowering. Good day! I have only a few and they are in our greenhouse (with our orchids). Armed in advance should problems occur. I have learned a lot from your tips. Thank you very much. Looking forward to the next tip or session. Till next time….. Aussie May. I bet your greenhouse with air plants and orchids is lovely! Thank you for your kind words! Thankyou for all your tips and information ,I have a red one and start loosing it’s red color ,then I realized I have been soaking mine for 3 to 4 hours sometimes in a stainless steel bowl among with my other air plant ,never turn them up side down,so some got brown roots .I don’t water them enough that is why I soaked them ,but now after reading your post ,realized all the wrong things I have done for them. Stainless steel is fine for air plants, but you only need to soak them for an hour – tops. Letting them drain and dry after watering is SUPER important. Gracias por tu gran generosidad de compartir tus conocimiento, para mi es nuevo el cultivo de la flor de aira. It was wonderful to hear from you. I lived in Chile about 20 years ago for a little over a year and loved your beautiful country and the people. Enjoy your air plants! Just got my first air plants. I excited to start caring for them and fixing the right places to put them. Then I noticed that to of them have flower buds coming out of them. I did some research and I read that air plant die after blooming. I don’t want to lose them so soon. Is this true? If I cut the buds off to keep them from blooming wil they live longer? It is true that after blooming that your air plants will eventually die, but they can live a long time after blooming. Also, flowers mean that the air plant will produce pups, so you’ll get a replacement air plant at the same time! I have never cut off the blooms on my air plants – I’m always so excited for the pups. I don’t know if trimming of the flower will prolong the life of the air plant. I live in Canada and these sellers don’t sell their fertilizers to Canada. 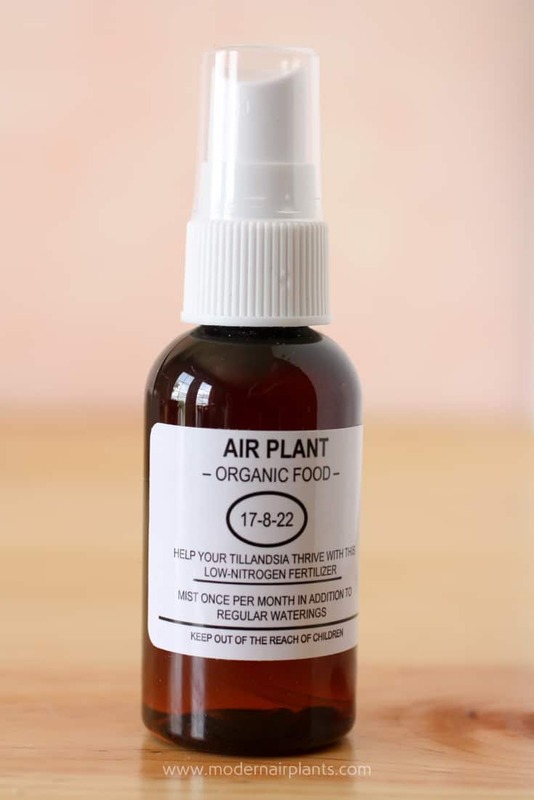 Is there a site other than amazon that sells Air plant specific fertilizers? Google bromeliad fertilizer and see what comes up. Those fertilizers will also work well. If you can’t find a fertilizer, it will be okay, your air plants should still do well. Thanks for the tips..I got into airplants just a few months ago like 6! Well so I’ve done very well with my orchids…but not so much on my air plants…I’ve lost 2 of the long grass type (can’t find a name for it) to rot..I think when I bought it had trouble it was very dry and I soaked it..and seem to have helped but then yesterday I watered them and it all fell apart and was mushy..I dry them on there side and upside down I have 15 so far and rest seem fine…any tips to look for with finding healthy plants? I couldn’t agree more! While air plants are SUPER EASY to care for, buying unhealthy (severely dehydrated) air plants is the fastest way to lose them. I am a proponent of buying them online. In my experience air plants from chain stores look terrible because they haven’t been properly watered/soaked and dried after watering. If you do purchase from a brick and mortar store, talk to someone who works there and find out how the plants are being cared for. I have purchased LOTS of air plants online and have been very pleased. They do look a little worse for wear after being shipped, but they look great about a week or so. I take a lot of comfort in knowing that they’ve been well cared for before I got them. I’ve had hundreds of air plants and I can count on one hand the number that have died. That’s how sturdy these crazy, amazing air plants are. 1. Ask someone who works there how they care for their air plants. If they say that they spritz them with water, the air plant is probably dehydrated. The exception is the T. tectorum. This air plant prefers spritzing. 2. Find out how long they have had the air plants. If they have been there for several weeks and haven’t been watered, or only misted–they are dehydrated. 3. 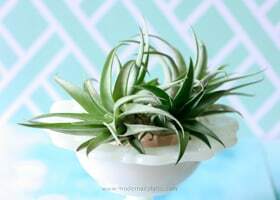 If you are buying from a specialty air plant store, or you live in a very humid climate, the air plants are likely in good condition. 4. 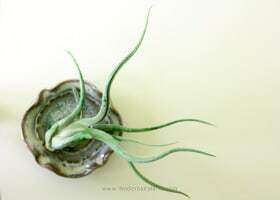 Most air plants will curl tightly when dehydrated. Look at the leaves on T. aeranthos, T. xerographica, and T. caput-medusae. These air plants will all curl tightly when they need water. PS: Like you I love orchids as well as air plants. In my opinion, they are perfect partners. I have a sister website dedicated to caring for orchids, I’d love for you to check it out! Just click on the link below. I am exceptionally grateful for this opportunity to learn all about tillandsia care. So far you have given me a wealth of useful tips. Thanks much. I am at tip three (3) and as always very excited for the next. Let me know if you have any questions about your air plants. I’m always happy to help. Brown tips are a sign of underwatering or over fertilizing. I have found that the thinner the leaf the more prone the tips are to turning brown. You could try watering more and fertilizing less and increasing humidity levels by using a humidifier(on the lowest setting). They could also be getting too much heat/sun. Try moving the air plants a little further from your window sill if they are right in your window. Or, you could try air plants with thicker leaves. A few leaves coming off at the bottom are okay, but if you notice the base turning purplish or blackish the base of the air plant has started to rot. Rot cannot be reversed, but it is easy to prevent. 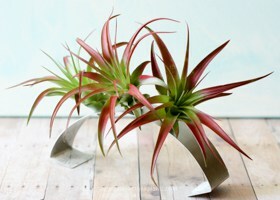 After watering your air plant, turn it up-side-down for several hours to let the water drain away from the plant. Thanks so much Anna. I took them out of the copper holders. After reading your article regarding copper. I also ordered the fertilizer recommended on your site. Gonna feed these little guys using your instructions. Thanks again. Remember to use a light hand with the fertilizer. Less is more. I’m enjoying my daily tips. Looking forward for the next one. Thanks so much for your help. I’m so happy you’re enjoying your tips! I love sharing information about air plants! Thanks on your valuable tips!